One of the most-asked questions I’ve received since opening up the blog for questions: "What is this thing—Jihad—that is causing Muslims around the world to be violent in the name of holy war?" Let’s break it down, shall we? It’s really quite simple, and probably not what you’ve heard on your television screens. Jihad means “struggle.” Nothing more, nothing less. A struggle with oneself internally, a struggle against injustice, a struggle against tyranny. Jihad does NOT mean, on the other hand holy-war-against-so-called-infidels-that-all-Muslims-are-supposed-to-do-so-non-Muslims-should-be-scared-of-their-Muslim-neighbors-and-kill-recent-college-graduates-over-a-supposed-parking-spot. While my neighbors are still probably scared of me and my family regardless (gotta love the racism in the south! ), I think it’s important to note that we Muslims are in fact quite friendly (and dare I say quite dashing). But let’s not get too off topic for once. There are really two types of Jihad: internal and external. The greatest/major Jihad mentioned in the Qur’an (the Muslim holy book) is the internal struggle with ones full self and soul in order to constantly self-improve: continually stand up for justice, become more truthful and sincere, and overcome vices and weaknesses. It involves a transformation of one’s character, overcoming an obstacle, and deep self-reflection. This is the Jihad that you don’t really hear about in mainstream news yet serves as the greatest Jihad for Muslims. 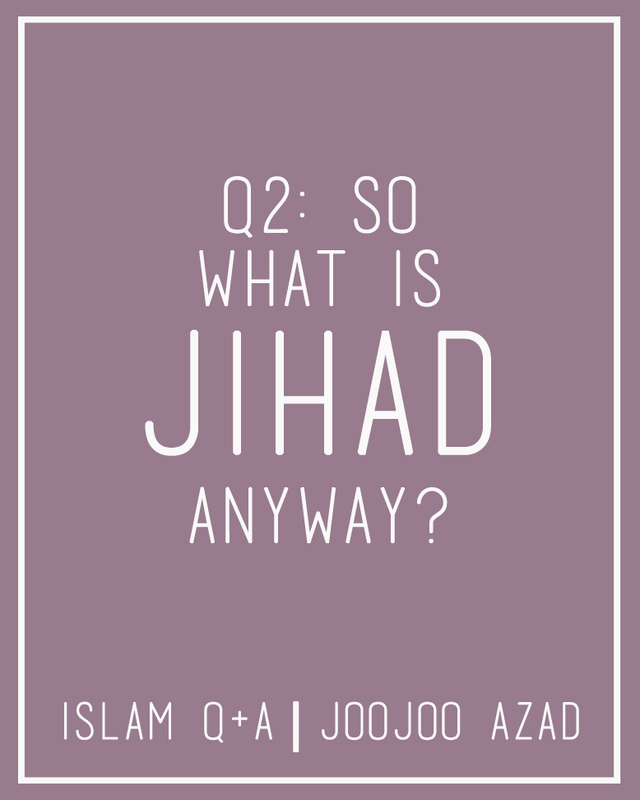 What you do hear, on the other hand, and quite over-excessively, is the mention of the external “Jihad of the sword.” This jihad, or struggle, is not described with the same level of value or importance than jihad an-nifs (Jihad of the self) has within the Qur’an. This Jihad is in reference to using violence—if absolutely necessary—in order to overthrow injustice. Today in mainstream media this is taken out of context (surprise, surprise) and therefore is an incorrect understanding of what the term really means. This external Jihad is used in the Qur’an in the context of the time when Muslim communities were being attacked on all sides (think: the crusades (these were of course much later but you get the point)) and needed to defend itself. But the key here is that this is not the same as an unprovoked aggression or holy war that western media makes it out to be. External Jihad is mentioned in the Qur'an in a highly particular and specific context from which it should not be separated. And when it does become separated, senseless violence still can't be justified, as "Jihad of the sword" is again, to fight against injustice, oppression, and colonial violence--and this doesn't necessarily mean through violence. Although also important to note that systems of oppression themselves are violent. That imperialism and foreign military occupation are violent. That injustice is violent. "Jihad-of-the-sword" is a form of self-defense. Jihad continues to be incredibly important, valid, and valuable today for Muslims globally--both internally and externally. It's a tool of self-betterment and self-reflection, improvement and meditation. Some Muslims (Muslims cooler than me, clearly) even made a hashtag (#MyJihad) about it. And a neat-o website that I just discovered. -- take a peep, as this website can serve as a helpful resource for learning more about Muslims' personal stories of Jihad today. Of course, I don't think I will even need to go into how this is different than what is carried out by ISIS -- senseless killings (of mostly other Muslims) that violate all of the core tenants of Islam. Comparable to Nazis massacring Jews, Gypsys, and others or Zionists massacring Palestinians or KKK lynching Blacks -- all in the name of their respective faiths, be it Christianity or Judaism. Best wishes from Belgrade, Serbia. Fascinating and insightful as always, thanks so much for educating me and sharing your life on this space, I really do enjoy reading your blog! wow, this is really helpful I think is amazing you are using your blog to explain people this kind of things (me included). Some people really get the wrong idea of many things regarding different realigions and is good you spread this to young people who tend to read your blog. Interesting and thoughtful info. on jihad, Hoda. 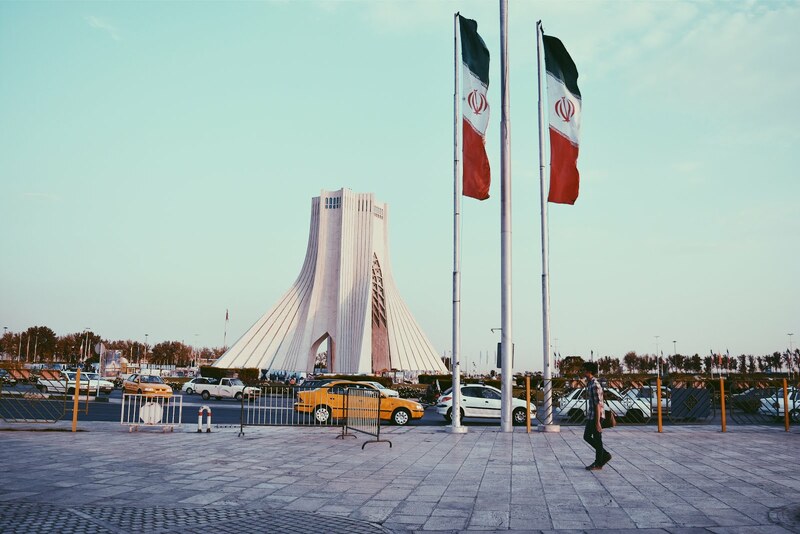 How long are you going to be in Tehran? Thank you for such an informative post. Media now days makes a lot of misunderstandings and blows things out of proportions. Also, it's sad that some people still are scared, angry or afraid of other people for their race, religion and culture. It's really unnecessary and shouldn't be at all. Thanks for making this post girl! Checking out those links you included too, I think it's a great idea they did a website on it. Thanks for taking the time to share more about your faith and explain some concepts that those that are unfamiliar with Islam may not know. Personally, I'm well acquitted with Islam so I have always known about Jihad being the internal struggle and this was partly because my high school history teacher took the liberty to teach us about global religions in a non-biased way. I would like to add that in France the separation of church and state took place many years ago before the arrival of a huge muslim population. The Catholic church fought tooth and nail against secularism but in the end neither crosses nor Kipas (Jewish head gear) or another religious symbols were permitted in the schools or public buildings. The French therefore have maintained a secular government for decades. I would like to ask why you don't think the Saudi Arabian government is not Islamic. Is it because they're Sunni and I'm assuming because you're Iranian you're Shia? In Iran women are required by law to wear a head covering but I think it should be a woman's right as to what they should wear. What do you think of Iran's law on men and women's attire? Hey! Thank you! I'm really glad to hear that you enjoyed this post and that it cleared up a pretty predominant misconception! I haven't heard the speech, but I'll definitely take your work for it! If he doesn't want people to join extremist groups he should stop meddling in the Middle East and causing such swelling of anger and hate! & Thank you so much for your warm Eid wishes! Hope you are having a wonderful time yourself! And can't wait to get some projects up from Iran! I love how open-minded and warm all of your comments are. You're basically fabulous to me, Linda. Hey, Cindy! Thanks for a really insightful and interesting comment--great questions! Glad to hear that you had the luxury of a good high school (or really, any year) history teacher--those are definitely hard to come by! In regard to France: yes, they are ardently secular. But to a point that it takes away from the fact that the French constitution allows freedom of religion. It takes away people's rights to observe their religion. Just as I am against the fact that they don't allow yamakas or cross necklaces, I am against the fact that they don't allow headscarves. It's denying a fundamental right. As for the Saudi Arabian government--haha no, the reason that I would not call them Islamic is not because of secular differences (if any--I prefer not to articulate my sect on my blog because I am against sectarianism and I believe it is irrelevant regardless) but because of various policies and actions of the government. And Islamic government does not live in luxurious palaces while their people are suffering. Not going to Tehran. Just wondering if you were moving there for a long time. Have a great trip!